"The Legend is back," says American Airlines — but those who have flown American in recent years might feel that American is only legendary for old planes and grumpy flight attendants. Here's a first look at their new-look, designed to remake how you feel about the airline. Currently within a drawn-out evolution that includes a merger with US Airways, American has a lot of irons in the fire. On January 17th of last year, American unveiled a whole makeover of their branding including a new "Flight Symbol" logo and aircraft livery. Aviation geeks and industry critics were quick to choose sides on the new look. My snap judgement at the time was that the new livery looked dull, and the tail was unimaginative. Two weeks later, I found myself at DFW airport, standing on the tarmac beside a brand new Boeing 777-300ER decked out in the new paint scheme. Her silver mica paint shimmered in the Texas afternoon sun, and I noticed how much detail is on the painted tail. I really came to admire it at that point. The inside of the plane was gorgeous as well, outfitted with Boeing Sky Interior lighting and all new seating from front to back. This was the first step, re-vamping their international flying. Now, let's look at what American has done domestically. American has been working quickly to put their old work horse, the MD-80, out to pasture while bringing on new Boeing 737-800s, Airbus A319s and A321Ts. Last week, American began flying their newest aircraft, the Airbus A321T from Los Angeles to JFK Airport in New York as well as San Francisco to JFK. On the inside, big changes will appeal to business travelers. Inside the A321T, First Class features 10 fully lie-flat seats with 43 inches of seat pitch when upright. Each seat offers aisle access, along with AC and USB charging outlets. Passengers can enjoy entertainment on a tilting 15.4 inch screen, heard through Bose QC-15 headphones. On American's Boeing 777-300ER, they use a very similar seat as Business class. I flew it to London, and it was the most comfortable seat I've flown in, to date. Business Class passengers will enjoy similar amenities, in twenty new 2x2 seats. 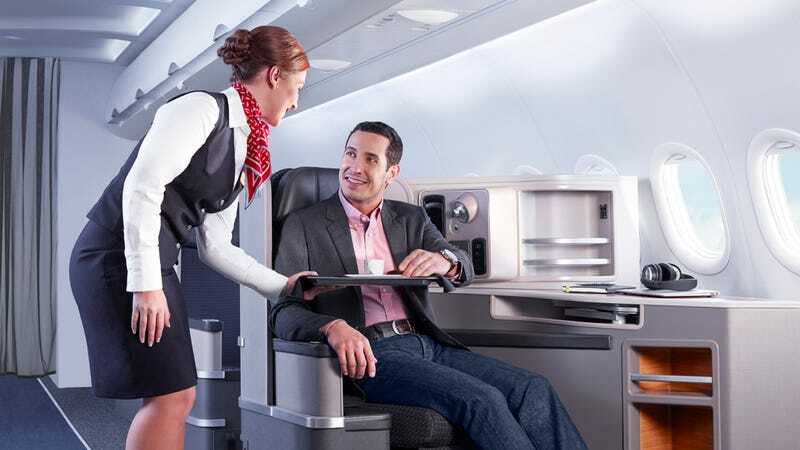 Even back in the main cabin, seats have been upgraded to include 8.9 inch touchscreen monitors at every seat with a variety of programming including movies, TV, music and games. No more craning your neck up toward the ceiling to watch reruns of "30 Rock." Completing the merger with U.S. Airways is American's next giant hurdle, as seniority integration negotiations between the airlines and their pilot unions are being contested in court. JetBlue has also introduced a new cross-country Business Class product called "Mint" - which is also outfitted on an Airbus A321. And, while not quite as posh as Qatar Airlines' latest cabin upgrade, this is definitely a big step forward for domestic US fliers. All photos were provided by American Airlines, unless otherwise noted above.